For the first time ever, more than 50 Disney villains will take over Disney’s Hollywood Studios for Villains Unleashed on Aug. 23, 2014. This new one-night-only party will kick off at 8 p.m. and run through 1 a.m.
As a record number of Disney Villains come out of the shadows and take over the theme park, guests will encounter some of their favorite villains such as Captain Hook, Cruella De Vil, Darth Vader and the Evil Queen. They will experience a special fireworks show, dance parties and villainous food, drink and merchandise. Villainous Encounters: Interact with Disney villains roaming the park, performing on stage, dancing with guests and making mischief around every corner. Fantasmic! 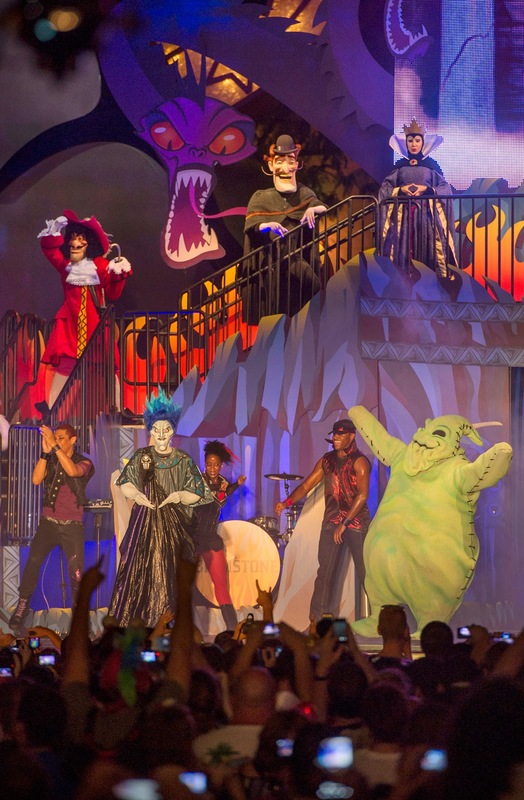 Pre-Show: Behold the wickedness as villains takeover Fantasmic! for a deviously fun pre-show. ‘Villainy in the Skies’ Fireworks: Villains unleash their powers into the night sky for a specially-themed fireworks display. Oogie Boogie’s Variety Show: Boogie down to Theater of The Stars to see Mr. Oogie Boogie host a special variety show crawling with entertainment. Hades Hangout and Dance Party: Hang out with the ruler of the underworld and dance the night away with his party crew the house band Bernie Briquette with Brimstone, DJ Igg Nite and the Underworld Dancers. “Star Wars” Villain Zone: Witness the power of the dark side as some of the most feared villains in the Galactic Empire patrol Disney’s Hollywood Studios. ‘Ex-Scream’ Makeovers: ‘Show your Villain Side’ and get your face painted to look just like your favorite Disney villain. Attractions: Revel in the fun of up to 10 favorite attractions such as The Twilight Zone Tower of Terror and Star Tours – The Adventure Continues. Beware of villains lurking around. Villainous Food, Drink and Merchandise: Enjoy special mischievous treats and remember the night for years to come with villain-themed merchandise. A limited number of tickets for Villains Unleashed are available now at DisneyVillainsParty.com, or call 407-939-1933.